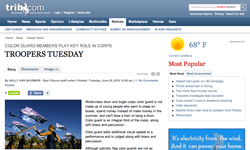 Color guard members play key role in corps Casper Star Tribune So why is the color guard important in a drum and bugle corps? One reason is they add visual appeal. They also help steer viewers through a story line and give the corps another area to score points. As Sally Ann Shurmer writes in the article, "They need the grace of a ballerina and the athleticism of a hurdler." Read this article. Drum corps takes playing seriously My San Antonio Everyone's heard it: "Well, drum corps is kind of like marching band." This article explores why drum corps is different. Gary Barnard, the Crossmen's assistant brass instructor, said "these are the kids that love music and love performing ... It's the next level." Read this article. Spectacle of world's top drum, bugle corps coming to Dublin Columbus Local News Dublin, Ohio will once again host a drum corps show featuring an impressive lineup of World, Open and All-Age Class corps. The event is Wednesday, July 7, and is presented by Dublin City Schools and the Capital Regiment Drum and Bugle Corps. Read this article. 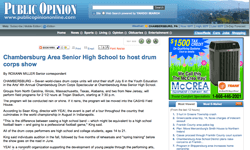 Chambersburg Area Senior High School to host drum corps show Public Opinion Seven drum corps will perform on July 6 at the DCI Tour event in Chambersburg, Pa. This event raises money for the local marching band, and Steve Delamater, event sponsor and lifelong musician said, "Without full appreciate and exposure to art, whether it be music or visual arts, it stifles one's imagination. I feel that it's integral in one's education." Read this article. 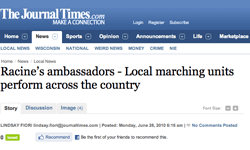 Racine's Ambassadors- Local marching units perform across the country The Journal Times There are two groups this summer serving as musical ambassadors to the city of Racine, Wis., the Lighthouse Brigade marching band and the Racine Scouts. In the article, Rex Rukavina, Lighthouse Brigade director said, "You talk about youth in Racine and all the negative press, and here we have kids working 9 to 9 out in the hot sun." Read this article. 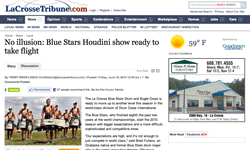 No illusion: Blue Stars Houdini show ready to take flight La Crosse Tribune Haven't had a chance to see the Blue Stars yet? Find out what the corps' 2010 production is about and what the goals are for the season. In the article, executive director Brad Furlano says, "Our percussion section is nothing like anyone has seen form the Blue Stars. This group will blow people away." Read this article.